Rose Hall Cottage is a private dwelling located in Middleton Cheney, Banbury. The kitchen of the property is prone to water ingress along the base of the external wall periodically during heavy rainfall due to water bearing against the base of the external stone wall. Koster were invited to carry out a trial on a section of track (the Metropolitan Line) located close to Farringdon station. The brief was to provide an elastic, permanent repair solution which would not cause any detrimental effect to the structure nor the trains passing through it. Edenside Barn is a real-life demonstration property in the Cumbria Flood Resilient Showcase. The idea behind the Flood Resilient Showcase Project was to use products and materials that will try to keep water out of properties prone to flooding. These luxury, new-build apartments benefit from stunning sea views on the South Wales Heritage Coastline at Ogmore-by-Sea and were recognised at the 2017 UK Property Awards, winning in the residential category for South East Wales. The development consists of seven high-end, 2-bed apartments built into a slightly sloping site. As part of their ongoing relationship with the Imperial College London, Newton Specialist Contractor A.P. Gooch was tasked with assessing and waterproofing 11 historic Victorian brick vaults beneath London’s streets, after the existing ‘waterproof render’ (not Newton's) had failed. This new build luxury property in North London provides almost 17,000 sq ft of accommodation, set over four floors. This spectacular mansion features marbled flooring, atrium hallway, several bedrooms, a home cinema, luxury spa, swimming pool, massage, nail bar and hair dressing salon, entertaining rooms, formal and informal dining rooms. High volumes of hydrostatic water pressure was bearing on the structure, which was causing the property to suffer severe water ingress through construction joints. Fed up of renting in London, Joe and Lina decided to build their own on a tiny 38m² plot of land in East London. With a budget of just under £200k they set about delivering Joe’s innovative concept for a six half-floor house with floating concrete slab, designed to maximise the space into a 83m² home, all whilst being filmed by Channel 4’s Grand Designs. This luxury 12 property housing development near Holmfirth in rural West Yorkshire was to be built partially into an embankment on a sloping site. The presence of lower ground floor layouts with earth retaining elevations within the new properties necessitated the involvement of a structural waterproofing specialist to form part of the design and construction team. Delivered on time and to budget. This project is unusual and offered an interesting scope. 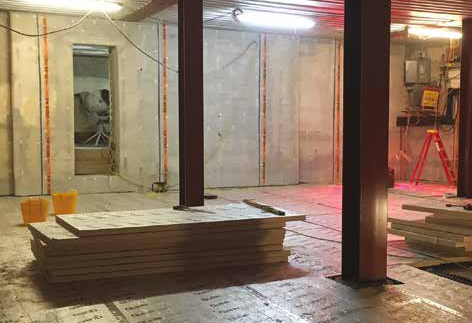 Delta’s Technical Consultant, Paul Callaghan was approached to give assistance on designing a robust waterproofing solution to a new build basement within a Synagogue in North London. Timberwise’s (South East) team were called upon to investigate a property with a problematic damp basement in Sittingbourne, Kent. The property is a typical Victorian constructed circa 1900’s semi-detached, brick constructed dwelling.